It doesn't count what life we live but what counts most is how we live the life. Life form as a human being is very much prized gifts that we have got to exercise it. Therefore every holder must take it in its perfect roundabout for the best result. Majority of us have vague answers on the purpose of life. One says that one's main purpose of life is to enjoy this gifted prize, some says that its purpose is just to live it while others argue for the purpose of striving for happiness. The purpose differs from one to another depending on the thoughts they perceive and believe in the things around us. 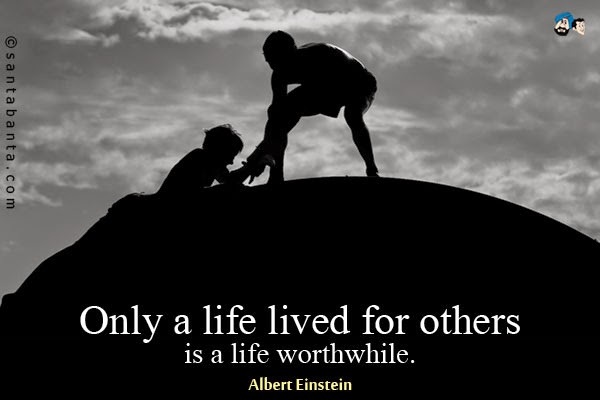 For me, I rely my purpose of life on Albert Einstein's statement, "I believe in one thing - that only a life lived for others is a life worth living." In simple I believe that helping others from heart is my ultimate purpose of life, that's why I live benevolence. I don't care about the judgement that others make of me or the things they talk about me either good or bad, all I care is about my everyday deeds, how much I have moved closer to my aesthetic dreams. No matter how small the things I do to excite others, all I would love to do is to do with my three inspiring Es: Energy, Empathy and Enthusiasm which is the greatest source of my encouragement those heighten me to greater heights of greatness. Life is always fulfilling and satisfying only when I am able to animate others in any ways. I become happy when I make others happy. I am blithe to have heart that is invariably guided by empathy. Only through empathetic feelings I am able to help others. Sometimes feeling others' feelings is really abysmal and I feel sorry for not being able to help but I feel great that I live up to my abilities. Dalai Lama boldly mentions, "Our prime purpose in life is to help others and if you can't help them , at least don't harm them." In one way human life is very much preciously beautiful, we are just like an angel and cherub but if you see through another angle it is the cruellest being on earth. We never get satisfied with what we are, through this, knownly or unknowngly we harm others for our needs and wants and slaughtering of innumerable innocent animals has been the greatest sin we have been doing that god will never ever forgive us. Though we think more we do not feel much, diverging ourselves from the main purpose of life. There are incalculable needy people who are readily eagerly waiting for someone who is kind-hearted and helpful-minded to come and give hands to them. I wish God could help them. I wish I could help every individual and make them satisfied with happiness. I desire to help every destitute and cash-strapped people and I know I can really do because I know I CAN.